Washington, DC -- CASJE (the Consortium for Applied Studies in Jewish Education) today released the final piece in its literature review series exploring what recent research about heritage, second, and foreign language learning means for the teaching and learning of Hebrew. 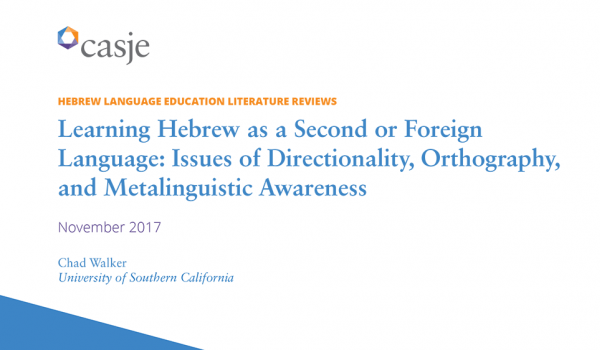 The newest review, Learning Hebrew as a Second or Foreign Language: Issues of Directionality, Orthography, and Metalinguistic Awareness, looks closely at recent literature on the Hebrew writing system—as well as other languages—and discusses the unique complexities of acquiring Hebrew and its right-to-left (RTL) writing system in today’s world filled mostly with languages that are read left-to-right and whose characters and correct spelling differ significantly from Hebrew’s. When assessing Hebrew reading comprehension and writing, account for Hebrew being a “homographic” language, meaning that because words are largely based on three-letter roots, groups of words look very similar to each other. Educators should thus pay attention to the use of vowels in the early stages of reading to help with the identification of isolated words and texts. Research shows that for learners of Arabic, clear (i.e., pointed) vowels can be beneficial even for skilled readers. Hebrew language educators should look for areas where reading accuracy may not correlate well with reading comprehension. Because of Hebrew’s root system, a learner may comprehend a word or text, while not knowing how to pronounce it correctly due to the possible ambiguity or lack of vowels being used. Or, in the opposite scenario, a very small percentage of readers — so-called “word callers” — may be able to read a written text quite fluently but not understand it at a similar level. The learners’ first language—English for most Americans—can influence their ability to attain proficiency in their second language. English’s vastly different characteristics from Hebrew, including direction, use of vowels, and makeup of words, poses challenges. For example, when a learner’s first language is read left-to-right, that individual will have spatial biases toward the left side of space and thus generally follow a left-to-right direction in how they perceive and produce. Native readers of a RTL language will have a stronger tendency to scan and process information in a right-to-left direction. CASJE is particularly interested in how this literature review informs future areas of research that would help practitioners who teach Hebrew. Read the full review here, and access the entire series here.